I love a good design dilemma, and I've got a great one to share with all of you small space dwellers today! Annabel, a friend of mine from growing up, sent me a message a couple of weeks ago asking my opinion on how to squeeze a dining space into the living room of her Boston apartment. She thought the topic could make a good blog post and I agreed - her dilemma is definitely not unique to her home - I figured it would be fun to tackle this issue on the blog so that y'all could benefit too! She also recently jumped into the interior design world, so it's been fun to chat with her about all things home. Be sure to check out her Instagram account for some fab inspiration @interiorjoy! As is true of many apartments and small houses, Annabel's home doesn't have a separate dining room, so her living room has to be multipurpose if she's going to have a dining table somewhere. She and her husband are itching to find a creative way to add one in that's functional and aesthetically pleasing. I've been there and dealt with this dilemma in previous homes - it's not always easy to figure out the best solution. It definitely gets old having to eat at your coffee table all the time though, and when you have friends over, it sure is nice to be able to host a meal around a real table, so, a dining table we shall add! Her living room is rectangular in shape with a lovely fireplace at one end and entries to the kitchen and hall on the other. The doorway you see in the photo below past the bookcases leads to the front entry hall. Across from that front entry doorway is the entry to the kitchen. Here's the floor plan showing the general layout of the room as it is currently so you can get a sense where everything is in the photos. The room is a great size at 14'x18', but the tricky part is that back section with the two entries. The space between them is a major walkway from the front hall to the kitchen, so you essentially lose a 4' section of the room in order to keep it open. As you saw in the photos, they currently have a small drop leaf table smack in the middle of that walkway that acts as a dining table, but that setup isn't ideal. You end up taking a slightly awkward path from the hall to the kitchen and I knew we could come up with a better solution! As I was thinking about the best way to create a dining area for this space, I quickly came to the conclusion that we needed to get a little bit creative with the kind of table we chose and its placement. 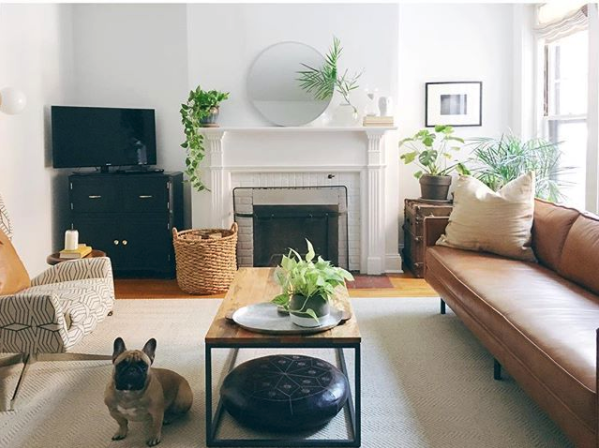 I started searching for inspiration and found some great ideas that helped me hone in on a couple of good layout ideas for Annabel's apartment. We'll get to those in a minute. An straightforward and easy solution to this design dilemma would be to push a dining table up against a wall. You can pull it out when needed, add a couple of extra chairs, and voila! You're set for your next dinner party. On a side note, I love how in the inspiration photo below there are two folding chairs hung on the wall - talk about an efficient use of space! In Annabel's apartment though, even if she shifts furniture around, pushing a table up against the wall still doesn't free up enough space to clear the walkway from the hall to the kitchen, so I nixed that idea pretty quickly. The long wall where she currently has her dining table would be perfect for this, but these wall-mounted tables are pretty small and really only seat two comfortably. There's no option to pull the table out to seat more folks when needed, so it's not great for entertaining. Plus, if you want to eat at the table every night, it's kind of a pain to have to set it up and take it down all the time. Another option that's also in the extreme space saver category is the "murphy" table idea. These are also wall-mounted, but are larger than the simple, collapsible table I shared above. They make good use of vertical space and, depending on the size, can seat two to five people. I think this idea is pretty clever, but it still has the issue of having to set it up and take it down every time you want to use it. 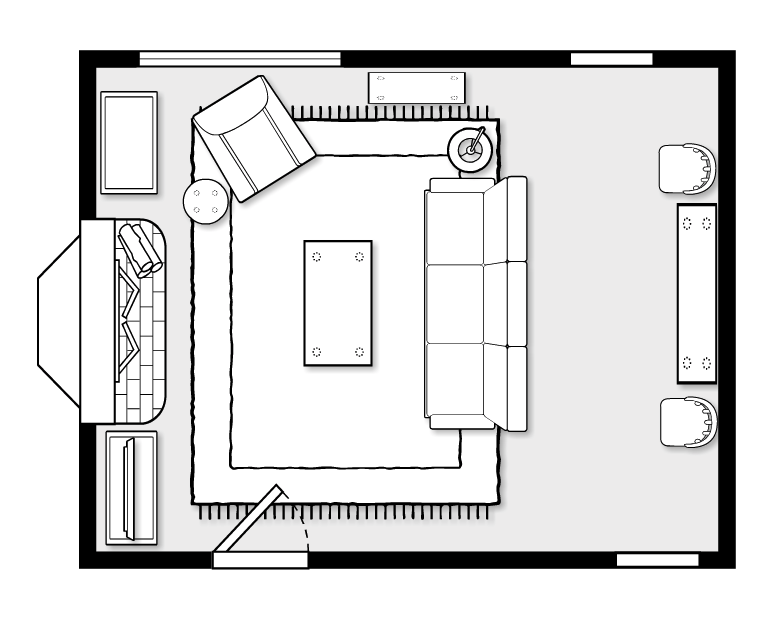 The final two ideas I came up are my favorite solutions, but before I share them, I think it's important to show you the new furniture layout options I came up with for Annabel's living room furniture. In order to create a real dining area within this space, I like the idea of moving a few pieces like the sofa, chair, and coffee table around. You'll notice that the living room furniture layout is the same for both options, but the placement of the dining table changes. I moved the sofa from in front of the windows to face the fireplace and the swivel chair is now by the windows instead. I also shifted the bookcase from one side to the other. So let's dive into these ideas! I think both of these are great options for Annabel's space - they're compact and efficient, but give you a real place to sit when you want it. The one issue with both of these solutions is where to put extra chairs since you can't really leave them in place. Well, remember that first inspiration photo with the folding chairs hanging on the wall? I think the long wall Annabel has would be perfect for this! If you pick up some cute folding chairs, they can also act as sculptural wall decor. A couple of beautiful upholstered dining chairs in a fun pattern like these would certainly do the trick. Or if you like a more classic look, I like the idea of these bamboo folding chairs. They've got great texture! With all of those ideas in mind for how Annabel can create a functional dining area in her apartment, I wanted to leave her with a few ideas for console tables and gate leg dining tables. I rounded up some great ones in several styles and sizes, and I hope that these will be helpful for you too if you're in the market for a small space solution to create a dining room in your own home!